Ranger has a place to call a permanent home. He is now in charge of kisses, licks, and tennis ball management. Although we had high hopes for Ranger, our expectations is not always the best for the dog. After an evaluation for a career of service to a local community, we realize Ranger might be better off giving kisses than trying to apprehend bad guys. Rather than start any type of advanced training, it was best decided to go the safe route and find him a good home. Ranger now has a wonderful family dedicated to a life of Exercise, Obedience, and Affection. He has a huge yard to run around in until he passes out. Ranger will definitely be missed by not only myself but also Bandit. Ranger was relentless in his play with bandit and really showed bandit how to play once again. Bandit's ability to play was something that had been missing for quite some time, and Ranger taught him to trust a dog again. We will miss his eagerness to please and playful bows to other dogs. I will not miss you chewing of my boots and bassinet. Bandit and Ranger hanging out. A special thank you to Joe Nick for respect and trust you have in me and my abilities to train and care for your dogs! Ranger now has two brothers and a sister to play with on a daily basis. Ranger is getting spoiled by his family and getting his own house built just for him! This dog house will be insulated and equipped with air vents and carpet. Below are pictures sent in by Ranger's family showing the love he has. Helping dad built the new house! Checking the measurements and specs to ensure they are following township code. They approve of the new structure! On behalf of Joe Nick, Myself, and the Mid-Atlantic K9 team; we wish Ranger the best and most fulfilling life. Remember Exercise, Obedience, and then Affection. 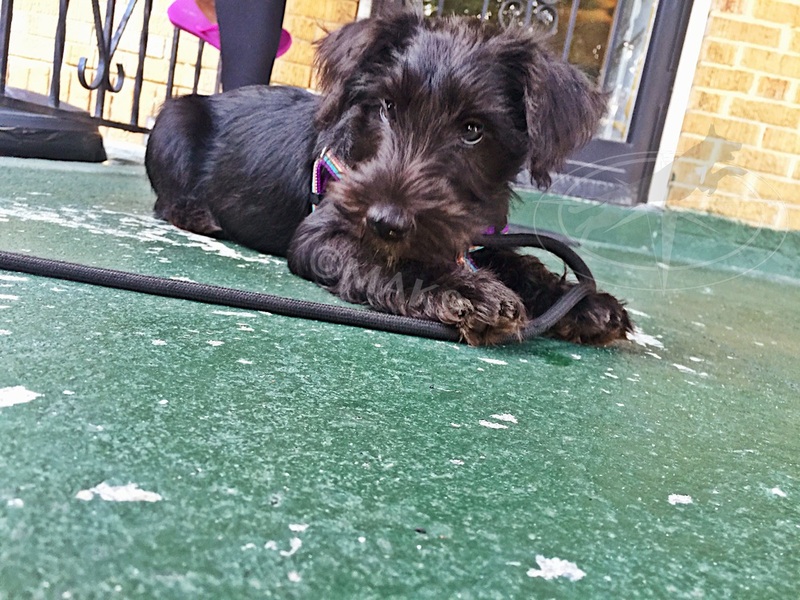 Our newest client is a 10 week old miniature schnauzer. Kenji's owner has done the smartest thing hiring a dog trainer early on in the dogs life. Kenji is a very smart puppy and that has picked up on marker training very quickly!!! KenjiPROJECT hanging out on the front porch. KenjiPROJECT already mastering the "DOWN"
KenjiPROJECT working on the stand command. Or we use the term "Pop-Tall"
Please stay tuned to see more picture of KenjiPROJECT out socializing and doing environmental training sessions all throughout Philadelphia!